Of all the IoT (Internet of Things) devices available, a good many of them are designed for measuring fitness and tracking activity. Even if you don’t wear an activity tracker, look around your colleagues and you’ll very likely see someone wearing such a device. I was at a health-related conference recently where the topic of Physical Literacy arose. As I understand it, the goal of physical literacy is not to push people into a particular sport just in order to keep fit. Instead the concept is to encourage people to learn basic movement skills, so they feel more confident in taking up physical activities and sports on their own account. For example, because people learn by doing, as a town council you might encourage activity by adding a walking trail or placing outdoor gym equipment. Or even just paint a hopscotch pattern on the sidewalk! It can be that simple. But the key to success is to measure outcomes. Even if you add physical challenges to your town’s environment, how do you measure if residents’ physical activity has increased? Simply select a number of residents and keep track of their steps using an activity tracker. 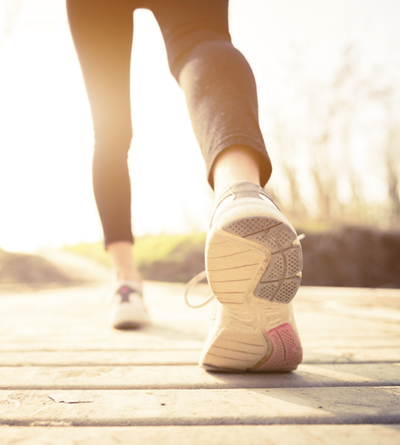 Even measuring just step count – and keeping records using FME of course – can prove that activity programs are working. It’s a wide range because most fitness trackers include not just the amount of activity, but GPS positions, sleep, nutrition, and others. As I said, although we’re talking trackers, this applies to other IoT devices, such as security cameras, cars, and home heating devices. So you can apply this to just about any device, but for now I’m using a Fitbit tracker. 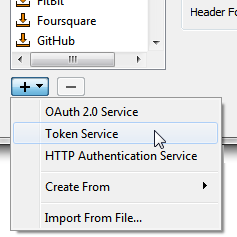 There are two parts to setting up an IoT connection with FME: setting up a web service (the developer part) and setting up a connection through that service (the user part). Here I’m both developer and user, though – as I’ll mention later – I don’t have to be. No this is not my real ID/secret! Sorry. But it’s very easy to create your own. 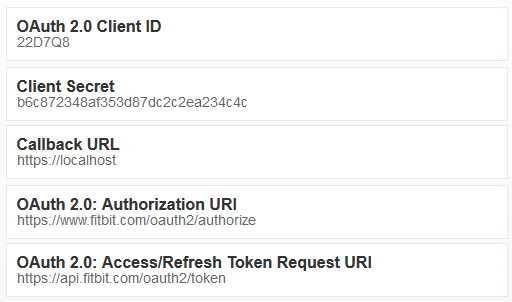 To be able to connect to my Fitbit account I need the web service set up with developer information. However, as a user I might not want to set up a developer account, or feel comfortable doing that. Well that’s OK. If someone you know (like me) has created an FME web service (like above), they can export it and share it with you (like, here)! So feel free to download the web service I created and use it. 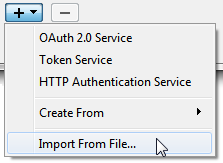 Just go to Manage Web Services under FME Options, choose Import from File, and select the above file. The password is “fme”. 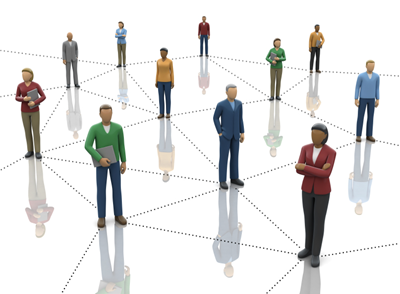 Once you have your FME web service – whether mine or one you created – as a user all you need is a web connection that makes use of that service. 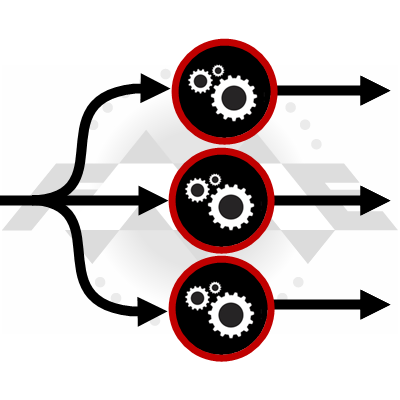 You’ve probably created similar connections already – either for a web service or database – so this should be more familiar. Basically it’s a set of attributes recording my activity, plus a list of exercise activities (just a single walk). I do take exception to the “strolling very slowly” part! To me 5.073773 km in 3152000 milliseconds (52.5 minutes) is not slow and is not less than 2mph; but that’s Fitbit’s interpretation and I can hardly blame FME for that! I also wonder whether measuring my walk to the nearest 1/10th of a millimetre is necessary, because we all know what problems excess precision brings. 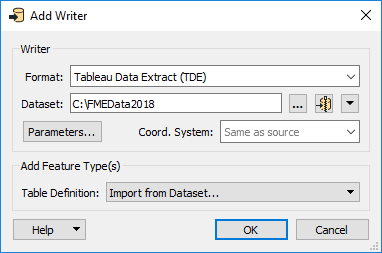 Write my data to an online visualisation tool like Tableau. That’s not to say the Fitbit dashboard isn’t good, but I imagine a dedicated visualisation tool would give me more control and variety over my statistics. Keep track of your daily distance activity and mark it off on a map; for example you could pick a route like New York to San Francisco, and update the route with your theoretical progress. That would be easy to do in FME using a ShortestPathFinder transformer to make the route and a Snipper to cut the route to your current total distance. Write your data to an online database, and have your friends and family do the same. That way you’re recording everyone’s activity and can compare results. Maybe generate a league table of the top scores (the HTMLReportGenerator transformer will help). Use a notification – either on FME Server or with a transformer like the Tweeter – to publish your accomplishments. Don’t like the default Fitbit badges? Make up your own! You can easily automate this to award yourself badges when certain goals are met; for example, you’ve walked as many kilometres as there are FME transformers. Scan nutritional information on a food package, interpret it (try the TesseractCaller), and push the information to the Fitbit food intake tracker. 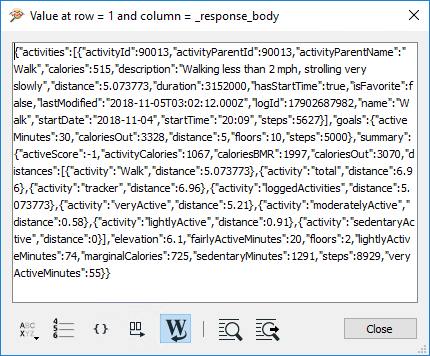 Convert Fitbit exercise logs to spatial data, record the data, and publish it through a web map. 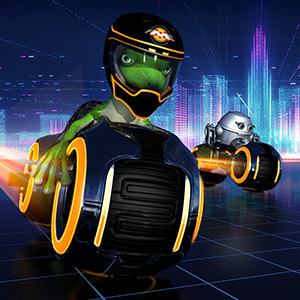 In short, let your imagination run riot! If you have issues trying to implement a particular task, everyone on the FME knowledgebase Q+A is ready to help. This gives me a line feature with the route of last night’s walk. After 5km, I must have slept well, something the sleep statistics would tell me if I cared to add that to the scope too. 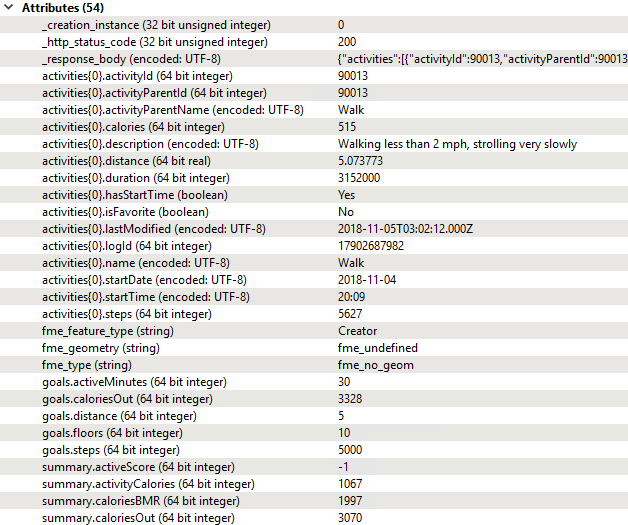 We now know that I can easily use FME to fetch Fitbit statistics and make use of them. 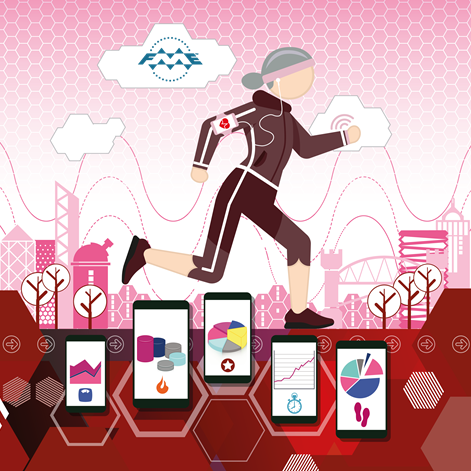 But fitness trackers like this are really about “gamification” – scoring points in competition with others – so collaborative methods are very useful. 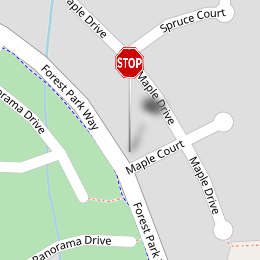 How is that achieved? Can I make a single workspace that reads everyone’s statistics? That is a little more complex. 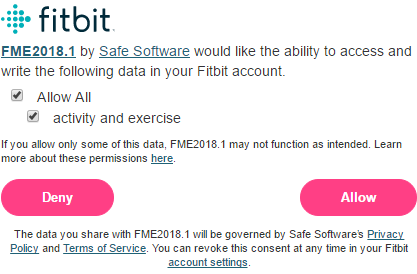 Although I only need create only one Fitbit application, the application needs a token for each user account it wants to access. 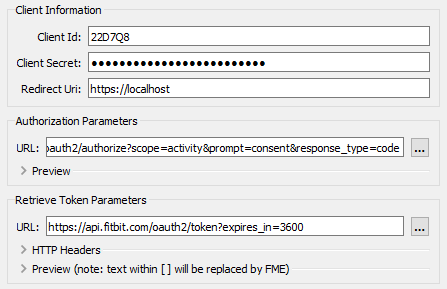 The token is stored inside each FME web connection, therefore each user account needs its own FME web connection. So I can create the FME web service (as the developer) and populate it with my own Client ID and Client Secret. I can then export that as a file (the client info is suitably encrypted) and share that service with other people (as I did above). These other people (users) can use that web service to create a new web connection, authenticated with their own username and password, to read their data. But that doesn’t mean my workspace can read your data. For example, I was hoping to be able to create a league table of FME Fitbit users, using a master workspace to query everyone’s account. But I don’t think I can do that. I can’t use my connection to query your data, even if we’ve used the same app. So if you used my app you don’t need to worry that I can read your data, and I don’t need to worry that you can read mine. Therefore, if I want one workspace that calculates statistics from several accounts, I have to try a method that’s more exotic. 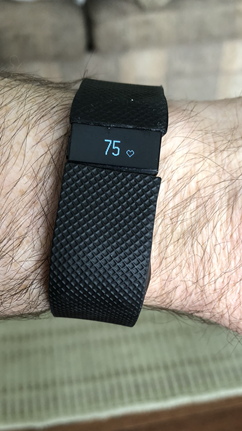 Load Data to a Database: I set up a workspace that transfers data from Fitbit to a database. Each person runs it as they wish, using their own connection. I have a separate workspace to create statistics from the database record. 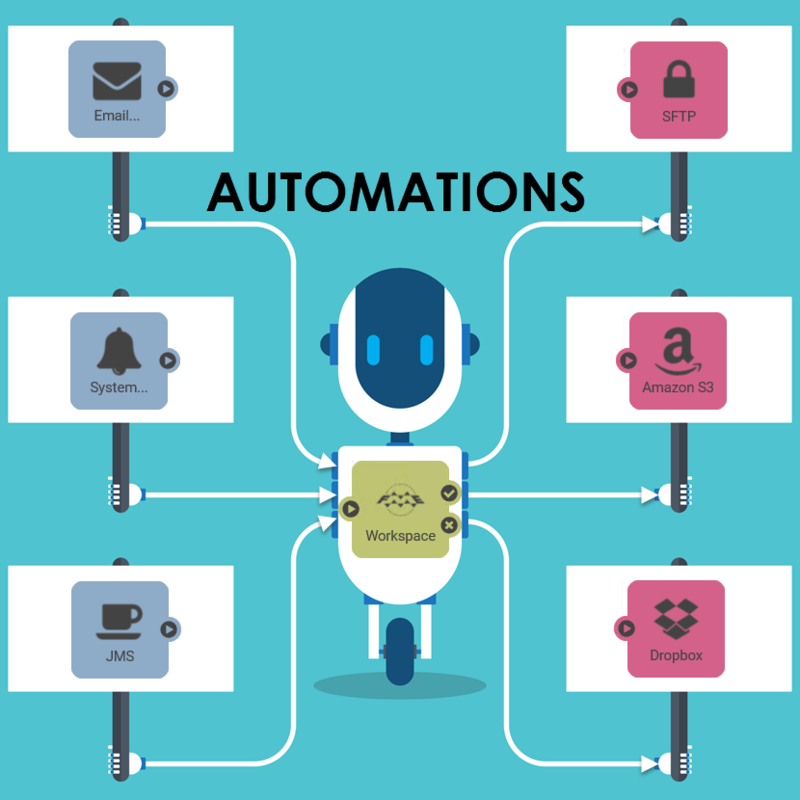 It’s easy to set up, but relies on users to run the workspace at regular intervals (they could, of course, set it up on a schedule). Set up Fitbit Friends: All my Fitbit users are “friends” with my account. Then my workspace can fetch statistics from their accounts. Still simple, but the statistics I can obtain from friends are less detailed than with full account access. On Server: Set the connection to a published parameter. Use the FME Server REST API to read a list of available connections (/security/categories/NamedConnections/resources is the command to use I’m told) and then run the workspace, each time sending a different connection to the published parameter. On Desktop: Set the connection to an attribute. Put a list of connection names in a text file. Read the text file. Each line becomes the attribute used as the connection name. I’m by no means a web services security expert, but I don’t see another way to have a master workspace create statistics from multiple users. Let me know if I’m wrong. 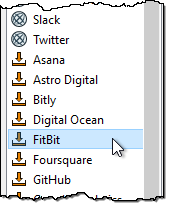 Browse to the Manage Web Services dialog in FME Workbench and you’ll see other supported fitness devices. Strava, for example, is a multi-device app that records physical activity. To me it seems focused more on running and cycling, rather than general exercise and movement like Fitbit. 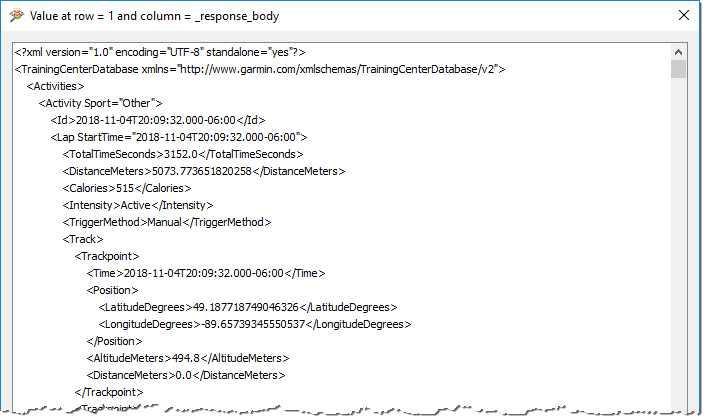 The Strava web service can be downloaded from the FME Hub and used to fetch data using the Strava API, again in much the same way as I did with Fitbit. Besides that, other devices I notice in the list are not for activity tracking. The Nest web service is for accessing Nest IoT devices, such as the Nest Thermostat or Nest Cameras. There’s even a video on YouTube that shows how to use the Nest API with FME. The Netatmo web service is for accessing similar devices for air quality monitoring, including thermometers and smoke alarms. 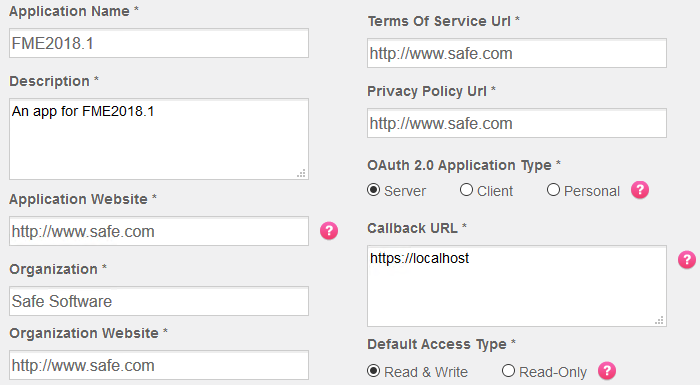 Then (for a Token Service) it’s a case of filling in the token request fields such as URL. Mostly the developer information for the device will include that. Whether it’s light bulbs or BBQ, you should be able to figure out which values go where to create your new web service. I will say that creating your own web service in FME is not always simple. It’s not the FME part that’s so tough; it’s because the authentication standards that exist provide only loose guidelines, and different web services interpret these guidelines in slightly different ways. It can be a bit of a battle (I spent a week or so trying to get a response from one API, and eventually gave up) but definitely possible. 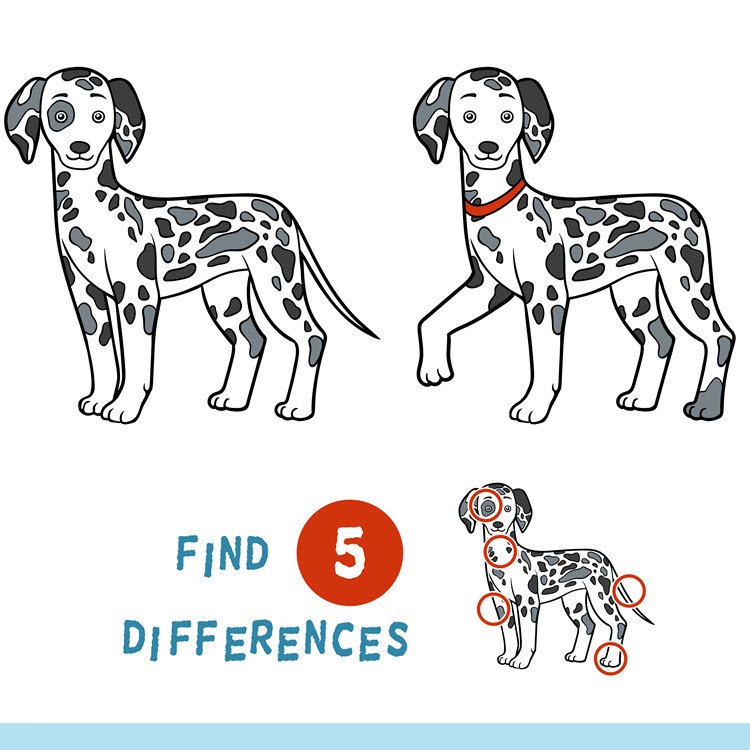 You can always ask for help on the knowledgebase if necessary. When it comes to the Internet of Things, FME has you covered. If the device has an open API then you can use FME to receive recorded information, or even to send commands to the device (yes Tesla, I’m thinking of you)! Throw in FME Server (or FME Cloud) and you get the power of notifications as well. This allows event-driven processing; so you can automatically contact your device in response to an event from elsewhere (the weather forecast is cold, turn on the heating), or make a notification elsewhere based on information from the device (send me a text message if my garden hose flow indicates a leak or blockage). As always, I hope that this content fires your imagination to do great things with FME. We have just decided that there will be an FME Holiday Hackathon for 2018, so that would be a great opportunity to try out some IoT integrations. Last year’s winning entry was a workspace to build 3D gingerbread houses. Maybe this year someone will be able to prepare a Christmas turkey using FME workspaces to control the cooking process? Or track your post-holiday exercises? I can’t wait to see what you come up with. Keep a watch on the blog and on the Knowledgebase for official announcements.